Asian stocks are mixed after the European Central Bank (ECB) introduced aggressive easing measures aimed at stimulating the eurozone economy. The ECB is the first major central bank to introduce negative interest rates, which will see it become cheaper for banks to lend money to businesses. Japan, Hong Kong and Australian stocks initially rose in reaction before giving up their gains in later trade. The muted response comes despite a strong rally on Wall Street. The S&P 500 and Dow Industrial Average closed at new record highs on Thursday on the new stimulus measures out of Europe. European stock markets and the euro currency also logged gains on Thursday. The ECB announcement saw it cut the deposit rate for banks from zero to -0.1% and reduce the benchmark interest rate to 0.15% from 0.25%. In addition to the interest rate cuts, the ECB will offer a package of cheap long-term loans to banks which are worth up to 400bn euros (£325bn). 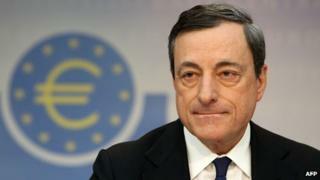 ECB President Mario Draghi also signalled there may be more easing measures to come. "Are we finished? The answer is no," he said in response to a question about the potential for more stimulus. CMC Markets analyst Max Ho called the ECB's moves "well-telegraphed". "We witnessed history in the making," he said. "While this move to cut deposit rates to a negative is considered to be bold and unprecedented, some observers are not convinced that it will have a significant impact on existing bank lending." Analysts said Asian investors are now turning their attention to US jobs data due out Friday. Non-farm payrolls for May are expected to show an improvement in the US employment market and are crucial to the US central bank's future policy decisions. Analysts forecast the Federal Reserve may raises interest rates and end its extraordinary stimulus known as quantitative easing (QE) once the jobs market and overall US economy is strong enough. Concerns about a reduction in QE, or the Fed taper, led to a sell-off in emerging market stocks and currencies in Asia last year. Frederic Neumann, co-head of Asian Economics Research at HSBC said investors are worried that a sudden jump in US employment growth "would accelerate the Fed's exit and push rates quickly higher". "As demonstrated during last year's taper tantrum, this wouldn't go down well in Asia," he said, adding that global interest rates are likely to remain low. "The world is stuck in a period of sub-par growth and consequently feeble price pressures, and there is little prospect of this changing any time soon given the structural headwinds still facing economies in East and West," he said.